It's been over seven months since GTArcade teased us with the announcement of a League of Angels spokesperson picked from some popular and fine Hollywood celebrities: “Black Widow” Scarlett Johansson, “Wonder Woman” Gal Gadot, “Spider Woman” Kirsten Dunst or “Hit-Girl” Chloe Grace Moretz. Three of them were fake, of course, but one of them had most likely reached an agreement with the studio to represent this popular browser MMORPG. Back then, we ditched the possibility of Scarlett Johansson (an actress used to star in some of the highest grossing movies) and Kirsten Dunst (doesn't seem like the best fit for the game), leaving us with two young, up-and-coming stars: Chloe Grace Moretz and Gal Gadot, who is going to become huge this year with the incoming release of the Wonder Woman movie. But with GTArcade's announcement that the League of Angels games have got a popular spokesperson who is “a movie star” and “she is seen as a superhero”, this leaves little doubt that they're going with Gal Gadot. The teaser image that you can see below reinforces this idea, showing a slim figure with long hair, traces well known from Gal Gadot. She is probably going to be some kind of female Hawkeye in the promotional shots, judging by the bow and arrows. 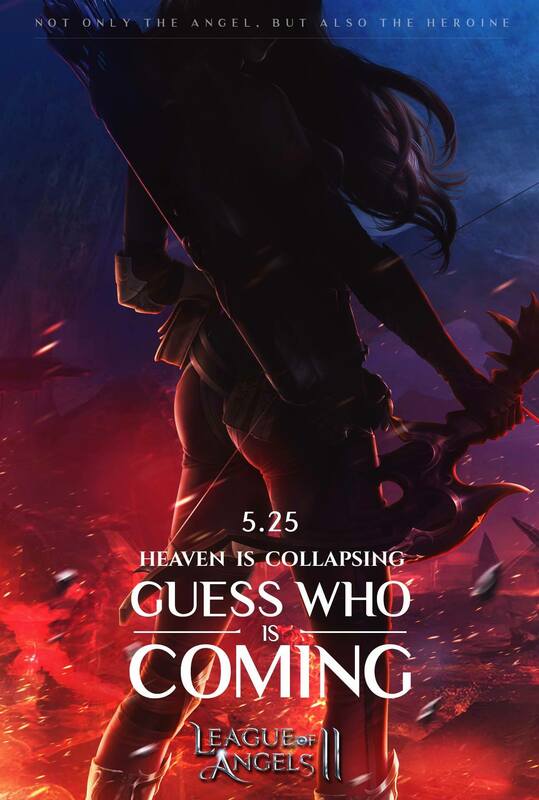 Right or wrong, we're going to know who this League of Angels spokesperson is on May 25, so let us know if you share our opinion or if you think she will to turn out to be someone completely different. Hey, the Black Widow is a superhero too, sort of, right? League of Angels 2 was released in April 2016 and just as it happened with the first game, it seems to have many players and an astonishing number of servers – over 500 servers are currently available.